This was the first title I ever produced - and it wasn't a game! It was Atarisoft's first non-games title for the Atari Home Computer System. 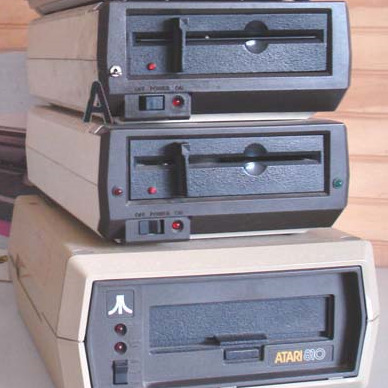 As a sister company to Warner Home Video, we created a commercial inventory and rental package that utilized 8 x Atari 1050 hard disk drives in parallel, an Atari 800XL, a TV and a dot matrix printer! It booted from a handful of 5.25" diskettes and likewise saved to even more! It was developed by a 3rd party husband and wife developer (whose name I forget, sorry!) based on their business software suite that they were selling for home computers. I came up with the snazzy name - "Film Inventory and Loan Management System" (F.I.L.M.S.). I was very proud of that! My responsibilities included the contract negotiation, product naming, developer liaison and product testing. I arranged the live testing of the product at video stores in the south-east of England. This included installing the hardware and software, staff training at the video stores, product support, troubleshooting and analysis of results. I also scripted a short promotional video on the "F.I.L.M.S" project, and traveled to Warner Studios in Geneva, Switzerland, to record and edit the final video production! Hard to believe we ever trusted any data on these flimsy babies! The product worked pretty well - certainly better than the manual records that our test sites were using - but the Atari systems were underpowered for the needs and would have been problematic had it ever been commercially released. The title was one of many casualties when Warners sold Atari in 1984.